Boil and slice about 1# carrots on bias. Combine 3-4 cloves minced garlic, 1/2 bunch chopped parsley, 1/2 bunch chopped cilantro, 1/4c. lemon juice, 1/4 c. olive oil, tsp. salt, white pepper. Add carrots. Serve chilled or at room temperature. Saute 1/2 lb. diced firm tofu in 2 tbs. olive oil until crisp and golden on all sides. Add 1 tsp. grated fresh ginger, a generous 1 1/2 c. grated carrots, 1 tbs soy sauce and 1/2 tsp sugar and continue to saute for about 2 more minutes. These are great for chicken, shrimp, salmon, or tofu Ginger-Lime-Cilantro Marinades: A. Whisk 6 tb Lime juice, 3 tb Honey, 2 tb Rice wine vinegar, 2 tb Olive oil, 1 1/2 ts Chopped cilantro, 1 ts Grated ginger root, 1/4 tsp. Red pepper flakes. 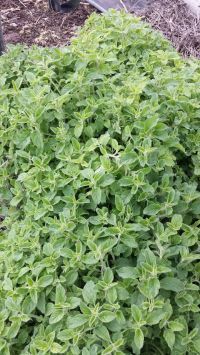 Use any combination of fresh herbs you like (we like to include about 1/2 oregano), chopped and tossed with minced garlic into about 1/4c hot olive oil. Let sit about an hour and toss with pasta.